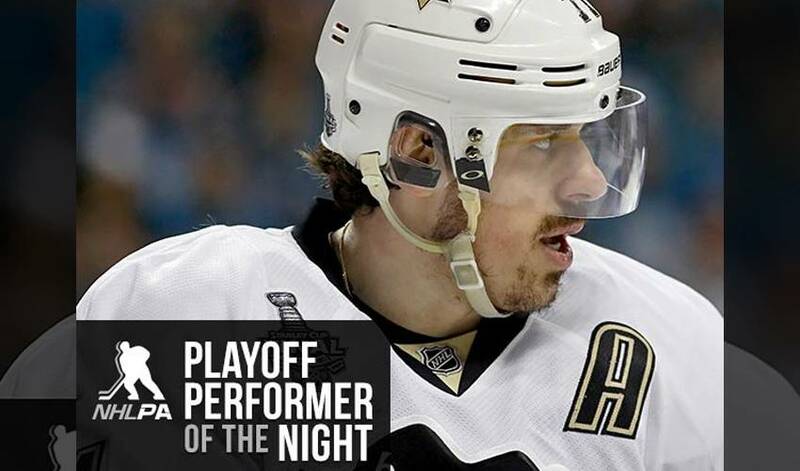 Evgeni Malkin took home PPOTN honours after Pittsburgh beat San Jose 3-1 in Game 4 of the Stanley Cup Final. Malkin had one goal and one assist as the Penguins moved within one game of winning the championship. STAT PACK: Malkin, named the game’s Third Star, registered two shots on goal, recorded one hit, and took 22 shifts in 14:23 of ice time. STAR POWER: Malkin picked up his 10th career game-winning goal in the postseason, which ranks third in Penguins history behind Jaromir Jagr (14) and Mario Lemieux (11). RAISING THE BAR: The 29-year-old has 128 points in 122 post-season contests, including 36 points in 2009, when the Penguins won the Stanley Cup and Malkin was named Conn Smythe Trophy winner as the playoff MVP. STELLAR START: Malkin scored a goal in each of his first six NHL games becoming the first player to do so in 89 years. The only other players to achieve the mark are Hall of Fame inductees Joe Malone, Newsy Lalonde and Cy Denneny. TROPHY TIME: Malkin’s impressive collection of hockey hardware includes the 2012 Ted Lindsay Award, the 2012 Hart Memorial Trophy, two Art Ross Trophies, the 2007 Calder Memorial Trophy, and two World Championship gold medals with Russia. SHARING A DAY: Malkin shares a birthday (July 31) with author JK Rowling, NFL players DeMarcus Ware and AJ Green, entrepreneur and Dallas Mavericks owner Mark Cuban, and actor Wesley Snipes. TAKING A CUE: When he’s not putting up four-point nights, Malkin is an avid billiards and soccer player. HONOURABLE MENTIONS: Matt Murray made 23 saves in the victory, while Phil Kessel chipped in with two assists. Nick Bonino was a plus-2 and blocked four shots. Melker Karlsson had the lone tally for the Sharks. Sponsored By BlackBerry And Hosted On NHL.com, More Than 19.5 Million Fan Votes Cast To Date in the First Ever EA SPORTS NHL Cover Athlete Campaign. Sponsored By BlackBerry And Hosted On NHL.com, Nearly 17 Million Fan Votes Cast To Date In The First Ever EA SPORTS NHL Cover Athlete Campaign. Lundqvist, Malkin, & Stamkos voted by fellow members of the NHLPA as finalists for the ?Most Outstanding Player? Ted Lindsay Award.